More men are leaving "manly" (read: high paying and prestigious) jobs to enter fields traditionally dominated by women, according to data: occupations that are more than 70 percent female made up about a third of all job growth for men from 2000 to 2010, double the rise in the 1990s. This is probably the worst morning ever for the creators of the failed — and horrible — sitcom "Work It", who are calling each other right now wondering how they fucked up their moment in the Zeitgeist. The New York Times reports men are becoming teachers and nurses, but also bank tellers, receptionists, and servers. And, unlike in previous decades, it's not just non-English speaking immigrants with few other options who are joining women at work: according to the Times, the trend is most pronounced among young, white men with college degrees: think Teach for America candidates who actually do want to teach Americans instead of continue on to law school or politics when their two years are up. Sure, the switch is in (large) part due to the recession. But, hey, it turns out there are some perks to "lady jobs!" Who would have thought? Sometimes, they're more exciting (one former IT worker, now a nurse, said that "I.T. is just killing viruses and clearing paper jams all day") and more rewarding: a 26-year-old Army veteran gained respect for nursing after watching a female peer save someone's life. "She was a beast," he said. Women: they can be "beasts" too. "I hated my job every single day of my life," said John Cook, 55, who got a modest inheritance that allowed him to leave the company where he earned $150,000 a year as a database consultant and enter nursing school. His starting salary will be about a third what he once earned, but database consulting does not typically earn hugs like the one Mr. Cook recently received from a girl after he took care of her premature baby sister. "It's like, people get paid for doing this kind of stuff?" Mr. Cook said, choking up as he recounted the episode. But what does this mean for women? Data shows that they're not being replaced by men — women are enjoying job growth in the same sectors — but some are quick to point out that the shift does not neccesarily mean the fight over gender equality in the workplace has been won, to say the least. 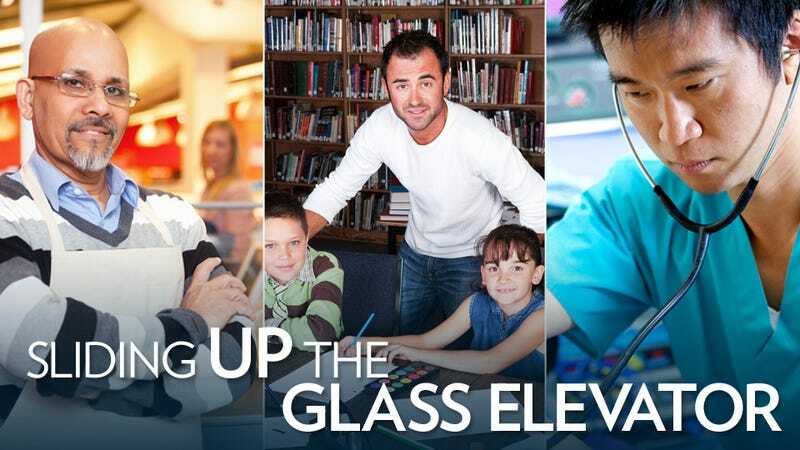 It's tempting and not totally unrealistic to contrast this phenomenon with the rising number of women earning college degrees and becoming CEOs, but men still earn more than women even in female-dominated fields, and white men can easily slide up the "glass elevator" without getting hit by the glass ceiling that women encounter when the situation is reversed. Plus, will the guys stick around after the economy recovers? Many of the men the Times interviewed said the jobs were "far harder than they imagined" (ha) but less stressful and gave them more time at home. Still, the uptick might slow down a bit once higher-earning fields start hiring again. "Are boys today saying, ‘I want to grow up and be a nurse?' " asked Heather Boushey, senior economist at the Center for American Progress. "Or are they saying, ‘I want a job that's stable and recession proof?'" One shudders to think of the sitcoms this new information will inspire.